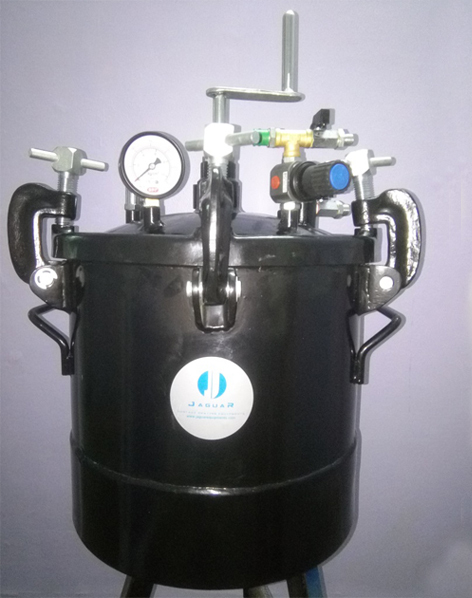 Pressure Feed Container| JAGUAR SURFACE COATING EQUIPMENT Pune, India. Pressure feed tanks are constructed with a heavy pressed steel lid and forged steel clamps, Plated tanks are equipped with top outlet, safety valve, pressure gauge ,pressure regulator. inner containers are available as per requirement for quick color change. Available with pneumatic agitator as per the requirement . Pressure Feed tanks are available in 5,9,22,45,100,150 and 200 ltr capacities. Available in Mild Steel and Stainless Steel.